Definition of Kivas: What is a Kiva? 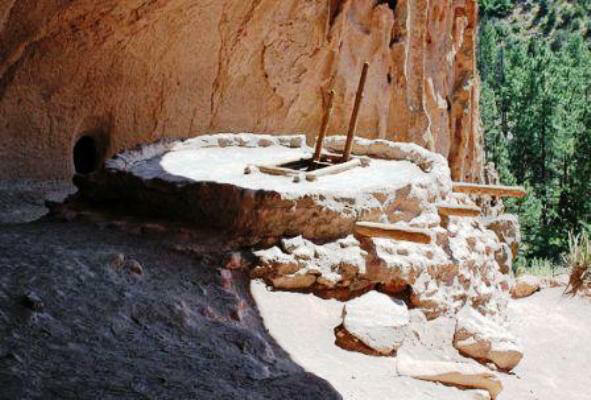 A Kiva is a special sacred building, usually built underground, that is used for spiritual ceremonies, religious rituals and ceremonial preparations by the Pueblo Native Americans and strongly associated with the Kachina belief system. Kivas consisted of circular chambers built almost wholly underground with the entrance through a hatchway on top. A ladder, made with long poles pointing skyward, was used to access the hatchway. Prayer Sticks were prepared in the Kivas and used for various rituals and ceremonies, including the Kachinas, for calling forth spirits in the evocation of a prayer. Kivas were symbolic of the entry to the fourth world, the present world, and the hatchway symbolized the emergence from the other worlds, the home of the Kachina spirits. A small hole or indentation in the floor of kivas called a 'Sipapu' symbolizing the portal through which their ancient ancestors first emerged to enter the present world. The Kivas were the sacred domain of the men and their secret rites. Historically, the men used kivas as both sleeping quarters and meeting rooms at various times of the year. The rites were concerned with rain-making, warfare, healing and hunting. Women were only allowed to enter the Kivas to take food to the men or to witness specific ceremonies. Modern kivas are used by men's ceremonial associations. The Second World was created for their emergence from the underworld, it was beautiful like the first world but in the Second World the animals no longer trusted the humans. The people once again forgot the Creator and the world was frozen into solid ice and destroyed. The other realm is the home of the Kachina spirits.